This focuses on the introduction of maps and globes and how we find our way around. The children will learn about directional terminology including north, south, east, west. We will distinguish between the different imaginary lines dividing the earth, longitude, latitude, Prime Meridian and Equator. They will learn about GPS and its connection to Albert Einstein. ** We have a subscription to brainpop and brainpop junior and we used these videos in addition to those from youtube. * Warm up: play Throw the Globe. Its an easy game of catch. Toss a beach ball sized inflatable globe. When you catch it and tell us what continent/ocean is your right hand on. * Think about: What is geography? geo = earth, graphy = write. Why is it important? Watch the introduction to Geography video. Create a travel journal/binder. This will be our binder for the neat projects, printable and foldables that we will be collecting throughout our study. Here's some great ideas to cover your binder. Printable world map labeled for easy reference. Print and put in your binder or maybe ON your binder. 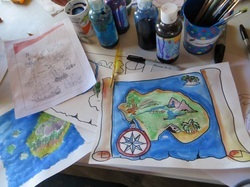 Use magazines, colored paper and the like to create a scrapbook, collage cover for your travel journal. Add some interesting facts to your cover using information from THIS website. Here's a neat idea. Using an atlas purchased at the dollar store - cut out shapes, letters or symbols to create a cover that is made with maps! Today we have Google Maps! We have pictures, and GPS...but how do these things work? How can we find our way around the great big world? WATCH the video GPS a quicktime video from NASA. We also have another video that's a little more in depth and talks about relativity, time and Einstein! After watching the video can you answer HOW a GPS Works? Add this note taking sheet to your journal write and illustrate. Just for fun watch 2 year old Lilly as she shows you around the map! Cute kiddo knows her map! Meridian: zero degree meridian (longitude) that passes through Greenwich, England. International Date Line: an imaginary line that goes through the Pacific Ocean at 180 degrees longitude. Equator: an imaginary line that divides the earth into northern and southern hemispheres. It is the zero degrees latitude. Tropic of Cancer: 23° 27 north of the equator. The farthest point north at which the sun can shine directly overhead. Antarctic Circle: the frigid zone located directly on the center of the south pole. Longitude: (meridians) imaginary lines going from the north to the south, but dividing the globe east and west. These lines are measured in degrees. Latitude: (parallels) imaginary lines going from the east to the west, but dividing the globe north to south. They are called parallels because they never touch. These lines are measured in degrees.